First, he sketched the map in pencil. Then he made a frame from liquid frisket, a material that hardens to create a border so that paint will not bleed. Then he brush painted the background before peeling off the dried frisket. Using extremely thin Italian brushes, he painted the street lines and used a technical pen to write street names. Based on the text of the story, he separately illustrated anecdotes — bikes, trees, Texas Theater, Bishop Street Market, a UFO — the same way. My frustrations stem from a slew of reasons. 1. A continued racist past. 3. Their name is advocate Oak Cliff but they only advocate for the affluent. 4. They use funding as an excuse to only cover white culture. 7. They only cover half of the story when it comes to a place. 8. They act as a paid marketing campaign. 9. People buy into this propaganda. 10. They understand what they are doing. The first map in blue is of Advocate Oak Cliff distribution coverage area. The area they distribute their free magazines and the parts of Oak Cliff they cover stories on. I35E has been the dividing line for segregation. 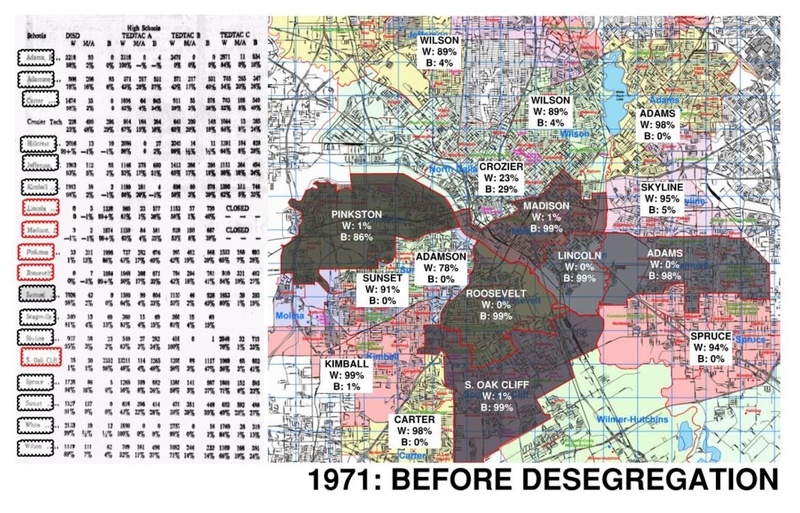 In which the second map shows Dallas starting to desegregate the schools in 1971. 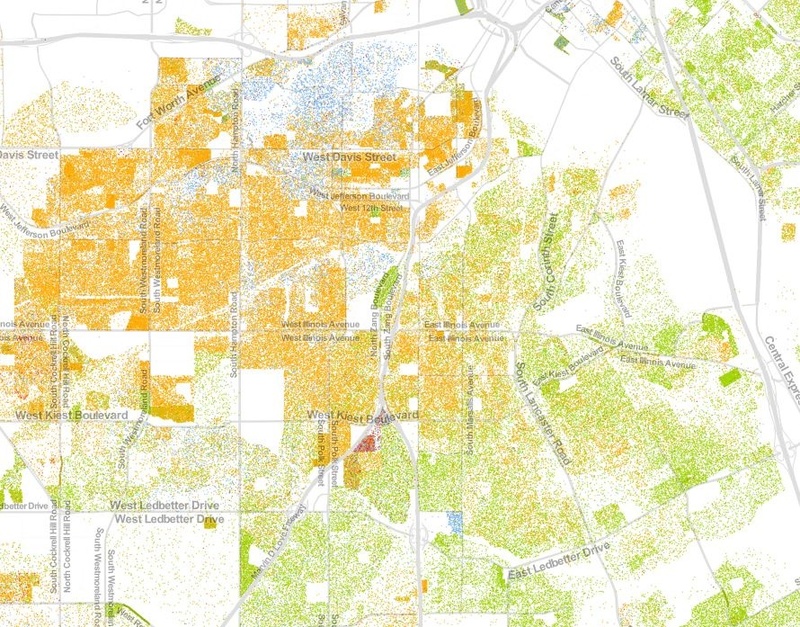 The last map is a demographic map from 2010 data. Blue are White, yellow are Hispanic and green are Black. 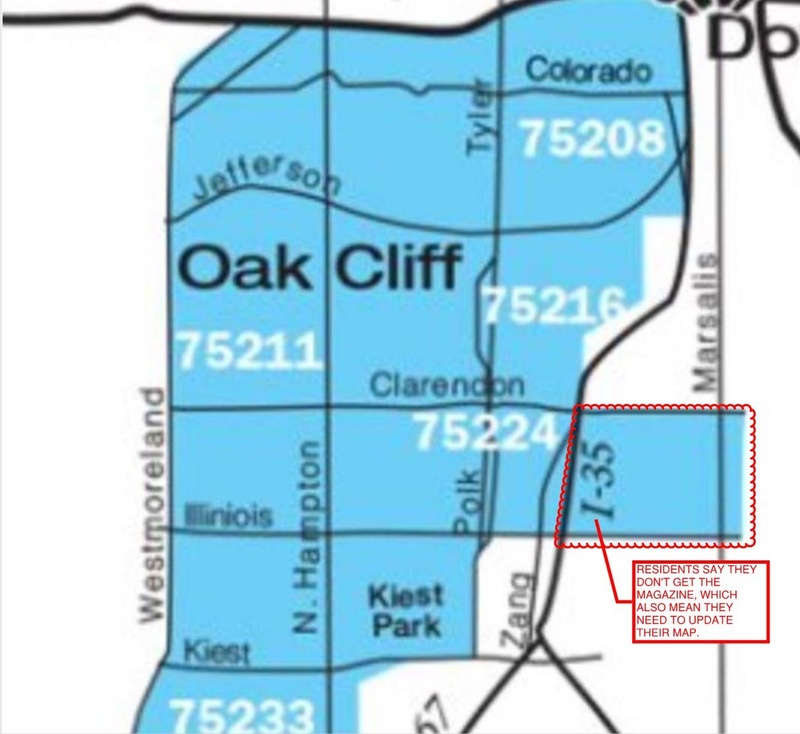 Advocate Oak Cliff is contributing to the racist history that has been around since segregation. They just use the excuse of business and money as a way to justify their behaviors. I’m lost here, which 2 sides are you referring to? & where does your frustration stem from? I will push my own agenda in desiring economically diverse neighborhoods in Dallas. One way I do this is by criticizing a magazine company that may say they support this idea but pushes their own agenda that supports the revival of white flight. Not going to concentrate criticism on one board. People will soon discover what you guys are doing. I think it’s sad that you guys blatantly choose to separate the two sides. Especially because most of you are white. It’s terrible that you want to contribute to the history of racism that has occurred in Oak Cliff since it basically took fruition. You can deny this and say that it’s about business, but history will only tell. The map looks nice, but what it represents is something different. IT’S NOT OAK CLIFF.